NETWORK FINALS: All of FOX’s comedies adjusted post-football: THE SIMPSONS down 0.2 to 3.3, BOB’S BURGERS down 0.1 to 2.1, FAMILY GUY up 0.1 to 1.8, and THE LAST MAN ON EARTH down 0.1 to 1.2. Elsewhere, NCIS: LA gained 0.1 in final numbers, while the run of RIDE ALONG lost the same. CABLE HIGHLIGHTS: Adult Swim’s ROBOT CHICKEN was the highest-rated scripted show on Sunday cable, up 0.02 to 0.56, with lead-outs HOT STREETS at 0.42/0.41 and SUPERMANSION up a tenth to 0.33. Showtime’s SHAMELESS fell a tenth to 0.55, and THE CHI ticked up to 0.20. On a season premiere night for HBO, DIVORCE returned at 0.22, up a healthy 0.08 from its 2016 premiere, and CRASHING’s 0.18 was up a tick from its February 2017 premiere. 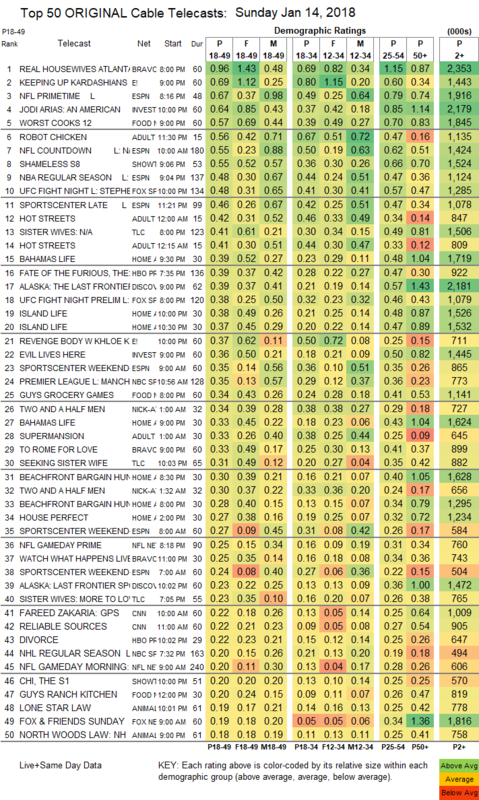 Bravo’s REAL HOUSEWIVES OF ATLANTA led unscripted and the night in general, up 0.03 to 0.96. On E!, KEEPING UP WITH THE KARDASHIANS jumped two-tenths to 0.69, and REVENGE BODY was up 0.15 to 0.37. ID’s JODI ARIAS: AN AMERICAN MURDER MYSTERY had a strong premiere at 0.64, and EVIL LIVES HERE was down 0.07 to 0.36. Food Network’s WORST COOKS IN AMERICA climbed 0.09 to 0.57, and GUY’S GROCERY GAMES was up 0.04 to 0.34. Fox Sports 1’s UFC FIGHT NIGHT was at 0.48, with PRELIMS at 0.38. On TLC, SISTER WIVES ticked up to 0.41, with a SEEKING SISTER WIFE lead-out at 0.31. HGTV’s line-up was led by BAHAMAS LIFE at 0.39/0.33, compared to last week’s 0.32/0.31. 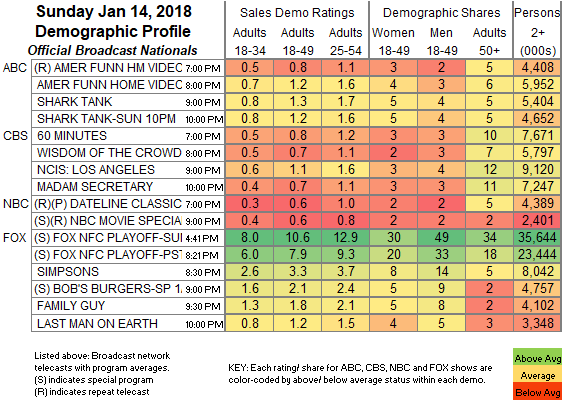 Discovery’s ATLANTA: THE LAST FRONTIER was at 0.39/0.23, compared to last week’s 0.32.